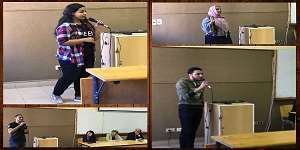 The faculty of Languages and Translation held the first singing audition on Tuesday 6/3/2018 to select the most distinguished voices to be qualified for the subsequent faculty talent show. Several candidates applied for the audition from all PUA faculties. Prof. Nadia Touba was on the panel of the audition.